Carole Boston Weatherford is one of my favorite poets and authors of books for children. Her picture book, Voice of Freedom: Fannie Lou Hamer, Spirit of the Civil Rights Movement won many awards and praises last year including a 2016 Sibert Honor. 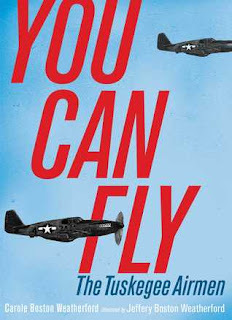 Weatherford's latest book, You Can Fly, is a small book that packs a big punch. The book is comprised of powerful poems about the Tuskegee Airmen who flew and fought in World War II. The second person narrative style of the poems is effective in placing readers in the story, giving them a first hand account of what it was like to serve in a segregated military. tells you cadets to look left and right. The men beside you may not make it. hoping you all beat the odds. You pray every night to make the cut." Readers will learn about the elite group of pilots, known as the Tuskegee Airmen, who trained in Alabama and fought bravely in Europe. Weatherford masterfully weaves together social, political and popular culture to paint a realistic picture of the U.S. at a time when men who did not have basic human rights and freedoms were asked to give their lives for their country. but racism was never in short supply." Jeffrey Boston Weatherford's black and white scratchboard illustrations are based on photographs from World War II. Back matter includes an lengthy time line of important events and a list of resources including links to museum sites and primary documents. You Can Fly is a recommended purchase for public and school libraries. If I taught American History in a middle or high school, You Can Fly would be required reading for my students. Just read & enjoyed this one. Her Gordon Parks book is another favorite of mine :).